Graduated from Proviso Township High School in Maywood, Illinois; received a bachelor of science degree in Electrical Engineering from Purdue University in 1956 and a master of science degree in Aeronautical Engineering from the U. S. Naval Postgraduate School, Monterey, California; recipient of an Honorary Doctorate of Law degree from Western State University College of Law in 1969, an Honorary Doctorate of Engineering from Purdue University in 1970, and Drexel University in 1977. Petroleum Economics and Management Seminar, Northwestern University, 1978. Awarded two NASA Distinguished Service Medals, the NASA Exceptional Service Medal, the JSC Superior Achievement Award, two Navy Distinguished Service Medals, the Navy Astronaut Wings, the Navy Distinguished Flying Cross, the National Academy of Television Arts and Sciences Special Trustees Award (1969), the Federation Aeronautique Internationale Gold Space Medal for 1972, the Cities of Houston, Chicago, Los Angeles, and New York Gold Medals, the VFW National Space Medal in 1973. Cernan, a retired United States Navy Captain, received his commission through the Navy ROTC Program at Purdue. He entered flight training upon graduation. He was assigned to Attack Squadrons 26 and 113 at the Miramar, California, Naval Air Station, and subsequently attended the Naval Postgraduate School. He has logged more than 5000 hours flying time with more than 4800 hours in jet aircraft and over 200 jet aircraft carrier landings. He occupied the pilot seat alongside of command pilot Tom Stafford on the Gemini IX mission. During this 3-day flight the crew used three different techniques to rendezvous with the previously launched Augmented Target Docking Adapter; and Cernan, the second American to walk in space, logged two hours and ten minutes outside the spacecraft in extravehicular activities. On his second space flight, he was lunar module pilot of Apollo 10, the first comprehensive lunar-orbital qualification and verification flight test of an Apollo lunar module. 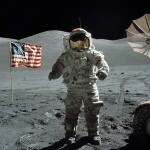 He was accompanied by Thomas P. Stafford (spacecraft commander) and John W. Young (command module pilot). He made his third space flight as spacecraft commander of Apollo 17, which launched at 11:33 P.M. (CST), December 6, 1972, with the first manned nighttime launch, and concluded on December 19, 1972. With him on the voyage were Ronald Evans (command module pilot) and Harrison H. (Jack) Schmitt (lunar module pilot). In maneuvering “Challenger” to a landing at Taurus-Littrow, located on the southeast edge of Mare Serenitatis, Cernan and Schmitt activated a base of operations from which they completed three highly successful experiments, making the Moon their home for over three days. In September, 1973, Cernan assumed additional duties as Special Assistant to the Program Manager of the Apollo Spacecraft Program at the Johnson Space Center. In this capacity, he assisted in the planning, development, and evaluation of the joint United States/Soviet Union Apollo-Soyuz mission, and he acted for the program manager as the senior United States negotiator in direct discussions with the USSR on the Apollo-Soyuz Test Project. 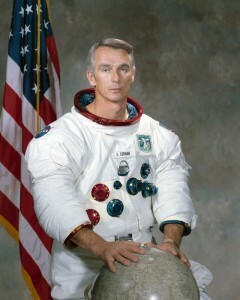 On July 1, 1976, Captain Cernan retired after over 20 years with the U. S. Navy. He concurrently terminated his formal association with NASA. Cernan joined Coral Petroleum, Inc., of Houston, Texas, as Executive Vice President-International. His responsibilities were to enhance Coral’s energy related programs on a worldwide basis. 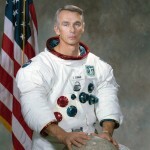 In September 1981, Captain Cernan started his own company, The Cernan Corporation, to pursue management and consultant interests in the energy, aerospace, and other related industries. Additionally he has been actively involved as a co-anchorman on ABC-TV’s presentations of the flight of the shuttle.